It’s that time of year in Northern Nevada, that time we begin to experience moments of spring-like weather interspersed with winter, meaning there’s still plenty of time to gather family to enjoy wonderful comfort food meals, while anticipating the coming season of organic vegetables and homemade goodies provided by local growers at our area farmers markets. As always, I use the freshest ingredients possible at both Cafe at Adele’s and at home. There’s a sense of wholeness that comes from knowing our local growers and bringing the meat and vegetables they grow organically and with a lot of love, heart and care, to our tables. When we shop local and support our farmers, it ensures they thrive, while providing the best and most wholesome foods for our friends and families. As the farm-to-table movement and the awareness of it grows, we’re doing our part to return to a time in this country when farming was an integral part of our daily community life. The difference today is we understand the importance of raising chemical-free meat and vegetables and how that plays into our overall health. Locally-sourced meat is available from Alpine Ranch, Nancy’s Green Barn Farm, Bentley’s and others, all easy to find on the web. Whenever possible, be sure to support your local growers. I promise you’ll be happy with the results. Mix rub ingredients thoroughly and pat evenly on pork belly. Wrap pork belly in plastic wrap and place in refrigerator for two days. Place these ingredients in a big pot and cook until boiling. Cut heat and set aside. I prefer white beans, though you can use any bean of your choice. If using dry beans, cook in plain water for about on hour, or until al dente. Drain and set aside. They will be added to the braising liquid. Note: If you choose to use canned beans, rinse thoroughly and set aside. These will not be added to the braising liquid until 2 to 21/2 hours into the total cooking time of 31/2 hours (one hour prior to service). For this recipe you will need approximately three pounds pork belly, available at Butler’s Meats or Centro Market. 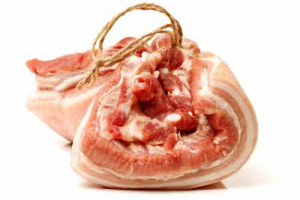 Remove pork belly from refrigerator, unwrap and cut into 1 1/2-inch squares. Using a large baking dish, gently combine braising liquid and self-cooked beans and distribute evenly. Add pork belly squares over the top, setting into the liquid. Seal tightly with a lid or with aluminum foil, and bake for 3 1/2 hours at 300 degrees. Pour into a serving bowl and add one cube of butter. Serve with a loaf of crunchy bread and a nice Roquefort salad.